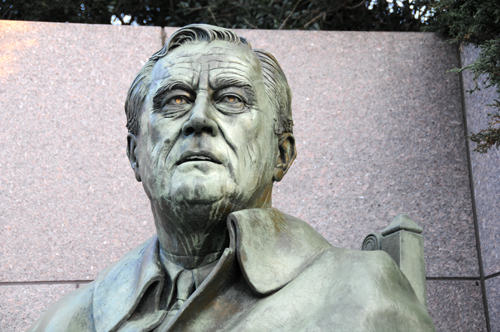 The Franklin Delano Roosevelt Memorial covers 7.5 acres and serves as a memorial to FDR and as a remembrance for the difficult times when he served as president. The large space is divided into four areas or rooms, each representing one of his four terms in office. The huge memorial has defined areas created by walls of red colored granite from South Dakota. This expansive design creates the effect of an outdoor museum, park and garden combined with space for waterfalls, sculpture and quiet areas. 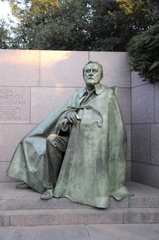 The images in this entry are of the sculpture of FDR in Room Three of the memorial. 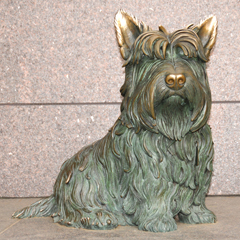 The sculpture by Neil Estern depicts the seated figure of Franklin Delano Roosevelt with his dog Fala sitting near him. They (who) seek to establish systems of government based on the regimentation of all human beings by a handful of individual rulers . . . call this a new order. It is not new and it is not order. I have seen war. I have seen war on land and sea. I have seen blood running from the wounded.I have seen the dead in the mud. I have seen cities destroyed.I have seen children starving. I have seen the agony of mothers and wives. I hate war. The Franklin Delano Roosevelt Memorial is located on the southwest edge of the Tidal Basin accessible by foot from the path around the edge of the Tidal Basin with another entrance on West Basin Drive SW in Washington DC. Click Here for Google Map showing the location of the entrance area of the Franklin Delano Roosevelt Memorial. 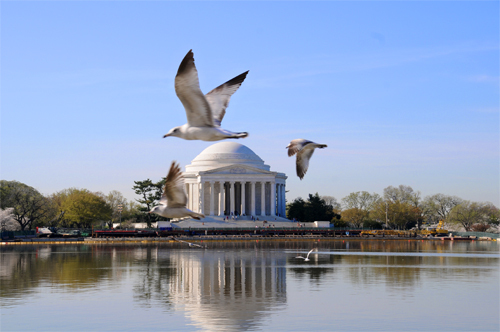 Thomas Jefferson Memorial With Seagulls. A lone cherry blossom tree is visible at the left edge of the photograph. This memorial was built between 1939 and 1943, and the statute of Thomas Jefferson was placed in the center of the memorial in 1947. Many more seagulls than you might expect to find in Washington DC find time to visit the Tidal Basin. Some visitors provide food for the seagulls, and that can attract them in huge numbers. Blossoming cherry trees line the edge of the Tidal Basis and provide a powerful attraction for visitors during the National Cherry Blossom Festival in the spring of each year. 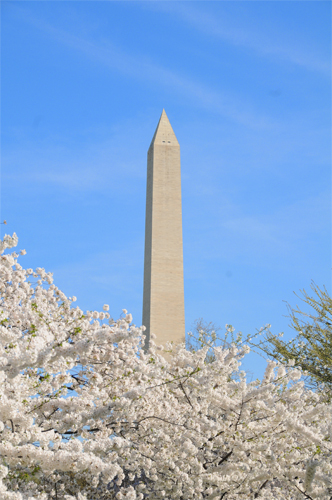 The peak bloom date for cherry blossoms changes each year, but it is usually in the first week of April. 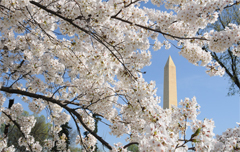 Click Cherry Blossom Bloom Schedule to visit the National Park Service Cherry Blossom Bloom Schedule. The Thomas Jefferson Memorial is located on the south edge of the Tidal Basin just off of Ohio Drive SW in Washington DC. Click Here for Google Map showing the location of the Thomas Jefferson Memorial. Closest Metro Station: The Smithsonian Metro Station on the Blue and Orange Lines is the nearest Metro Station to the Thomas Jefferson Memorial. Every spring around the first of April the cherry blossoms come to Washington. The blossoms are accompanied by the annual Cherry Blossom Festival and busload after busload of visitors. When the blossoms come, the sidewalks that wind through and under the cherry blossom trees are often crowded with visitors from early in the morning until late into the evening. 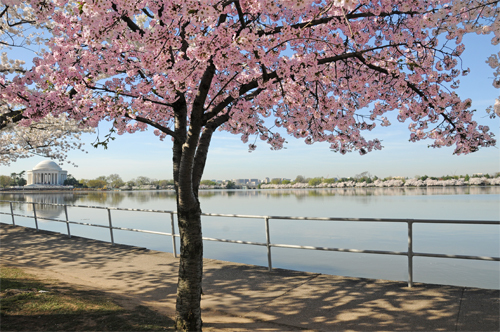 Many of the cherry blossom trees line the edge of the tidal basin where the Thomas Jefferson Memorial is located. This picture of the Washington Monument was taken from the sidewalk around the edge of the Tidal Basin. Click Here for Google Map showing the location of the Washington Monument. 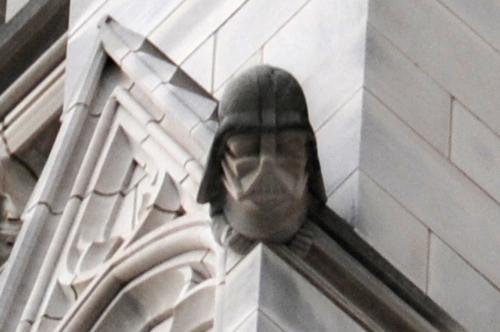 Included among the many, many grotesques (carvings) located on the National Cathedral is one of Darth Vader from Star Wars. The gargoyles on the building act as drains, as each gargoyle has a pipe running through its mouth. 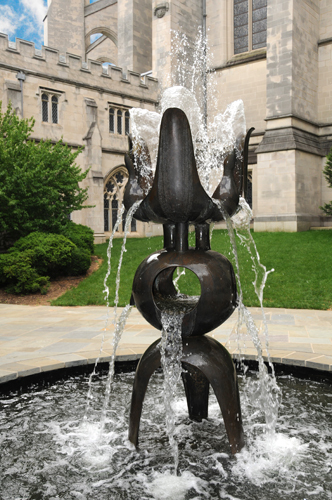 The grotesques are similar ornamental carvings but without the pipes. Darth Vader is located on the back of one of the front towers, the tower on the left from the viewpoint of a person looking at the front of the Cathedral. 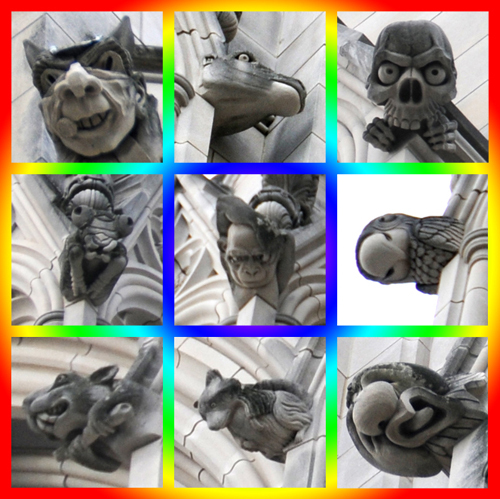 Pictured below are a number of other grotesques located in Darth Vader’s general neighborhood. The cute little raccoon looking thing must have drawn the short straw in order to end up right next to Darth Vader. 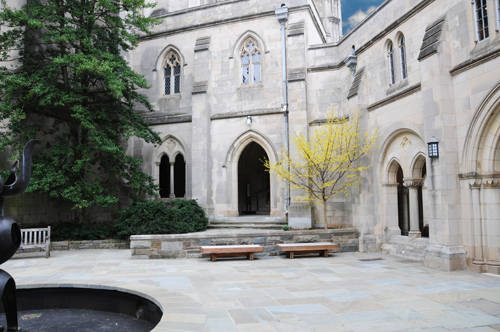 Lost Symbol by Dan Brown: Darth Vader is mentioned in Chapter 31, and the grotesque at the Washington National Cathedral is mentioned in Chapter 79. 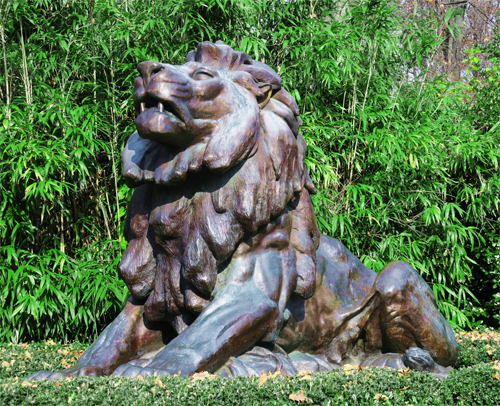 The National Zoo in Washington DC is one of the best zoos in the United States. 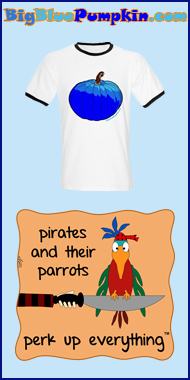 There are about 400 different species and about 2,000 different individual animals. The Panda exhibit is always popular, but there are lots of other animals including Anteater, Bald Eagle, Cheetah, Clouded Leopard, Elephant, Golden Pheasant, Gorilla, King Vulture, Lemur, Lion, Orangutan, Peacock, Seal, Tiger, Wallaby plus many, many other mammals, birds, reptiles, amphibians, fish and invertebrates. Click Smithsonian National Zoological Park Website to visit the website of the Smithsonian Institution’s Smithsonian National Zoological Park Website. The National Zoo in Washington DC is located on Connecticut Avenue NW just north of Hawthorne Street NW, Washington, DC. Click Here for Google Map showing the location of the Smithsonian National Zoological Park. 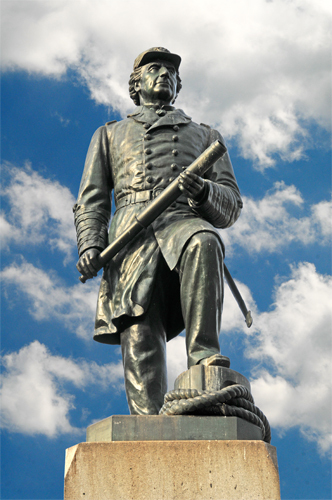 President James A. Garfield dedicated this statue of Admiral David G. Farragut from the Civil War in 1881. 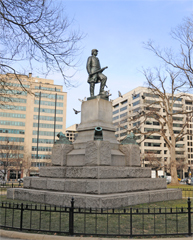 The statue is in the center of Farragut Square which is located about two blocks north of the White House and the Eisenhower Executive Office Building. David G. Farragut shouted “Damn the torpedoes! Full speed ahead!” while taking the harbor in Mobile, Alabama during the Civil War. 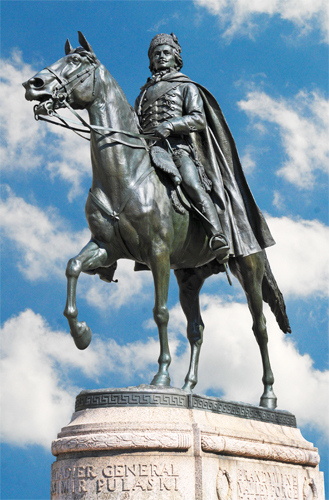 The statue of David G. Farragut is located just to the south of the three street intersection of Connecticut Avenue NW and K and 17th Streets NW. Click Here for Google Map showing the location of the David G. Farragut Statue. 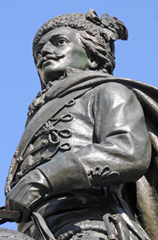 Closest Metro Station: Farragut Square is very close to two Metro Stations. An entrance to the Farragut West Metro Station is just across I Street NW from Farragut Square, and an entrance to the Farragut North Metro Station is across K Street NW. 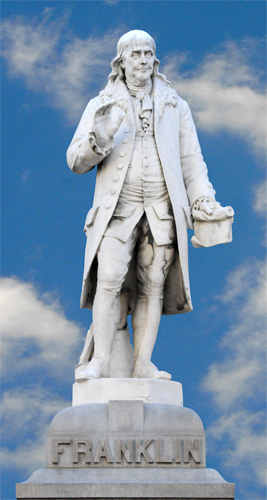 John Witherspoon signed the Declaration of Independence as a member of the Continental Congress elected from New Jersey. He was a Presbyterian Minister born February 5, 1723 in Scotland. He died in 1794 in New Jersey. 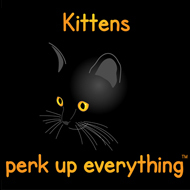 For my own part, of property I have some, of reputation more. [period added] That reputation is staked, that property is pledged on the issue of this contest; and although these gray hairs must soon descend into the sepulcher, I would infinitely rather that they descend thither by the hand of the executioner than desert at this crisis the sacred cause of my country. 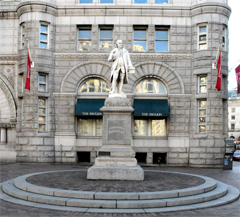 The John Witherspoon Statue is located on a small triangle created by the intersections of Connecticut Avenue NW, N and 18th Streets NW near Dupont Circle. Click Here for Google Map showing the location of the John Witherspoon Statue. 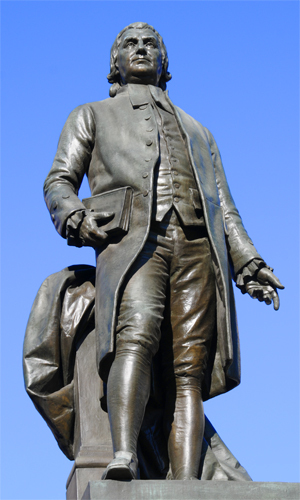 Closest Metro Station: The Dupont Circle Metro Station on the Red Line is nearest to the John Witherspoon Statue.